Four Wentworth Sailors entered the largest centreboard regatta in the southern hemisphere on December 5th and 6th, the Sir Peter Blake Regatta. Every sailor was given a pair of red socks in commemoration of the 20th anniversary since Sir Peter himself wore them and brought the Americas Cup to NZ. All four sailors were sailing in relatively new boats to them personally and had incredible results. Sailing conditions were perfect on both days. 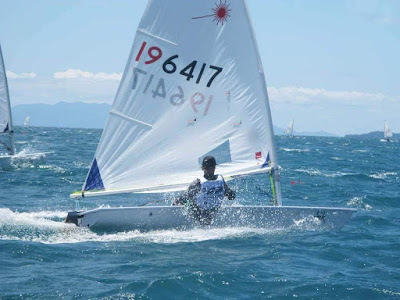 Harper Johnston achieved a Silver in Starling Green, Sean Herbert a Silver in Starling Open, Oliver Reeves 24th and Liam Herbert 26th in the Laser Radial class against Olympic sailors.